But, I am not a day counter. I work at making the days count. It’s Memorial Day weekend and it’s time to remember. Our middle school band will be marching in the Memorial Day parade and the band students had written a “Who I am marching for..” paragraph and included a picture. Most picked family members who had served and a few picked people from the community. The paragraphs would’ve gone unnoticed had the band director not posted them in the hallways for all to see. Like many things in our school, and probably in all our daily lives, some things just go unnoticed. So, we did a ‘school walk’ Friday morning to check out who is marching for whom. When we got back to class, I played the video below for my students. There was quiet across the room. For a few, the day became more than a day to sleep in and play games with their friends. I am certain there were a few who were unmoved. I do what I can, influencing a few, and focusing my energy where it is needed most. If I were marching for someone today, it would be my dad – he served in the Marine Corps and it left an indelible mark on him, and thus on me. I have posted about my dad many times before – here is Veterans Day – Semper Fi. With nine days remaining, it is more important than ever to make the days count. At school, we are working on our final project for ELA. Our unit theme is perseverance. Lately, it seems, everywhere I look I see perseverance. Our focus is what we can learn from the perseverance of others. We began with Winston Churchill’s “Never give up” speech, since, we’ve read a few fictional and real stories of people overcoming adversity and now my students are piecing it together in a multimedia presentation. In geography, we are looking at how European countries have persevered over the ages and how physical geography has played a role in it. I am excited and the kids seem to be more engaged in geography class these past couple of months than they have in all year. Maybe, it’s the realization that all we have done so far is relevant, or maybe they can see the light, or that the seeds I planted early in the year have bloomed. Regardless, I am going to take the figurative ball and run with it. And then, these are my last nine days as a seventh grade teacher. Next, year I move up to eighth grade and switch to science. It’s that time of the year, again. Looking ahead, but keeping a firm gaze on what is happening around me. I work at making the days count. At home, looking ahead to summer is happening, too. W’s schedule this summer will keep us grounded. He has football camp until July and then he’s off with the scouts to boundary waters and ten days canoeing and camping. But, we need to be grounded, too. There is always something to do at home – whether it’s gardening or maintenance, or organization. There is always some task that needs to be done. On top of that, I’ll be preparing for a new curriculum – science and US History. It’s almost like a new job. In the short term, we need to navigate the final days of school. W and O have ten more days – a quirk in their schedule lets them out one day later than me. Next year, they will start school the same day as I do and I’ll get out a day later. Regardless, there is much to do. O is in her last year of elementary and she’s on to sixth grade this fall. W has finals to take before he is finished with his sophomore year, but he’s having a difficult time focusing on the present. Though, lately he’s been grateful that I blog and I have a good memory, for now. Looking back at that time in my life, things were very different but the changes that were happening inside of me weren’t all that different from what he is experiencing. He’s wrestling with that age old question of we all asked ourselves; “what am I going to do when I’m done with school and why is it important?” I suppose that begs the question I am broaching with my own students – persevering through adversity. I work at making the days count, which is why I write. I began writing four years ago this weekend. Well, maybe not exactly four years ago, but my “hello world” went live the Saturday before Memorial Day. I posted again that Saturday night before I went to bed and the rest is history, so to speak. My First post, ever – Day 1 – 5/29/2010: What am I doing? It’s Memorial Day, there is the parade, then we are home. This morning, I scanned through the news feed on Facebook and was overwhelmed with the folks who had posted reminders about Memorial Day. I shouldn’t be surprised, my cluster of friends has the same value set as I do. It’s Memorial Day and I work to make the days count. It’s going to be a great day, I know it and I can feel it. There is the energy in the air, the feeling of possibility. So, I had better jump up, jump in and seize the day. Today is gonna be a great day, then tomorrow. Making the Days Count, one day at a time, one parade, one speech, and a lifetime to remember. How will you spend your Memorial Day? 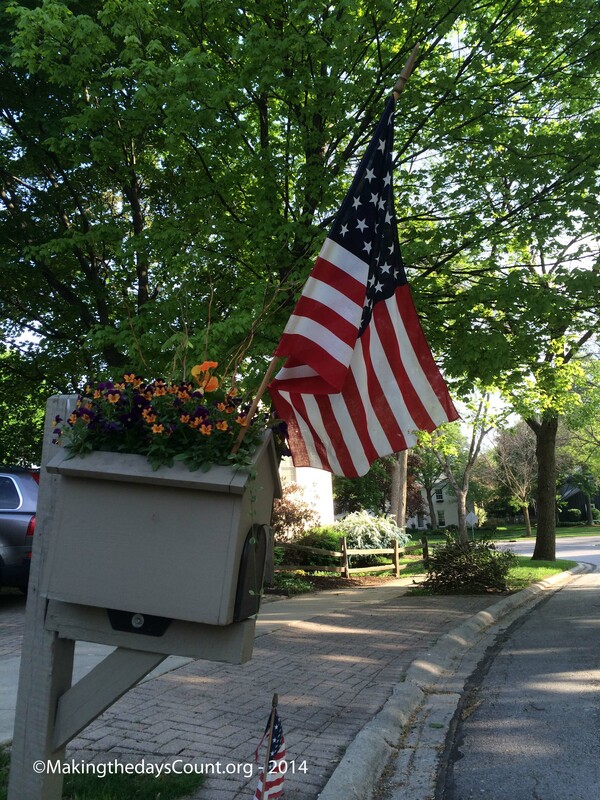 momma’s mailbox – decorated for the weekend…. I wish I would have had more teachers like you when I was in school. I probably would have enjoyed it more. It seems so improbable that summer is nearly here at last after a rather hellish winter. But now that it is almost here, it also seems like last summer only recently happened. Like you, I plan on making every day count! Mary, Thank you. I try to channel some of my best teachers, but school and the science of learning has changed so much since we sat in the classroom. Kids learn in completely different ways than we did, and maybe we would have learned more if we had been taught differently. Who knows?? I am always looking for ways to make a connection and create a relationship with my students…. bec ause they don’t care how much you know until they know much you care… thanks. My son is counting down his remaining days in high school on a wipe board in his room. Since he’s my “baby” I’m trying to make every one count. 🙂 Hope you have a great week, Clay! Thanks Coleen… those photos were taken with my phone – I am always amazed at the quality. I got a new camera and I need to work with it to figure how to use it and all the features…. by now your son is done and looking ahead to the next step – college. The days between now and then will be a blur.. and go much faster. Enjoy! Ha! I remember those days being a kid in school. I was one of those who would count the days down to the hours and minutes until summer vacation. Memorial Day is not just about BBQ’s and parties. It’s a day to remember the sacrifice out service men and women have made. Sure, we all want to enjoy the three day weekend, but also remember why we have the freedom to do so. I also wrote a post about this. My day today will be low key. Hitting the gym. Maybe run a few miles. See the new X-Men movie. Get ready to go back to work tomorrow. 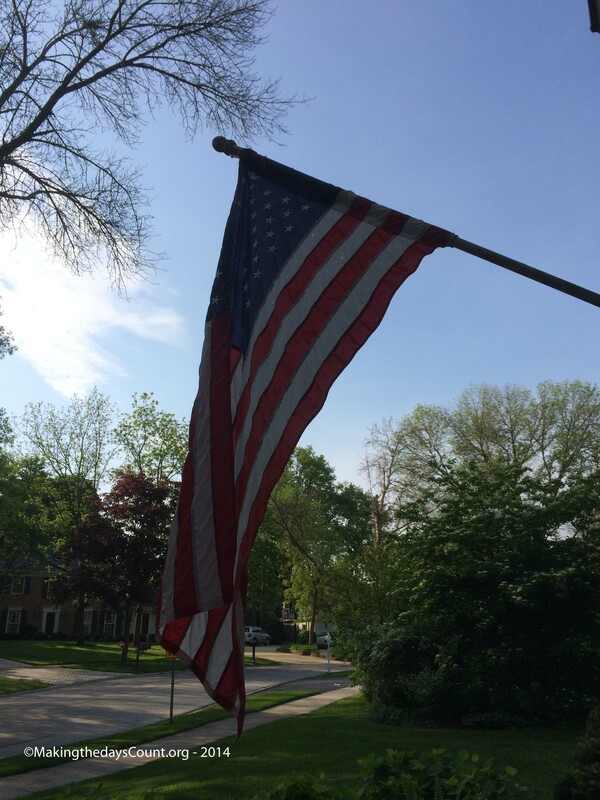 I saw your post and commented – I don’t remember Memorial Day growing up, it wasn’t until I moved the Midwest that it took on more meaning for me. I never miss a Memorial Day parade. As for enjoying the day I sure did – the week screamed by and got a lot done. There is so much more ahead! Have a great weekend. Nice to have the kids involved even on a non-school day. Hopefully it will make the day more meaningful. There was quite a crowd for the parade and the speech by a West Point grad was on the mark. I was disappointed in my students – only a handful attended the parade and most of those were marching in the parade….. I remind myself it’s not their fault, it’s the parents who make it happen or not…. it is my mission to let them know of the opportunity. They need to make it happen.. some will, some won’t. Thanks.